This is our ARCHIVE site. This site contains content that was on our community site "amset.info" and is no longer maintained. However as there are large numbers of links to the content on the internet, it has been retained on this site so that people who find that information of use, can still access it. However it cannot be guaranteed to be up to date, or accurate, particularly with regards to modern best practises. Most of the content was originally written between 1998 and 2008. Image watermarks refer to the old url of amset.info, which is another domain under control of Sembee Ltd. This article is for Windows 2000, XP and Server 2003 machines. If you are using Windows Vista, Windows 7 or Windows 2008 / 2008 R2 then you should follow this article. If you have purchased a machine from one of the big manufacturers, you will have seen that they have customised the "System Properties" window with their own logo. In addition, there will usually be a button next to it, which gives you additional support information. These two items are known as OEM information, and can be easily replaced with your own. This is useful if you build your own computers, or in a larger office allowing you to place the company branding on the machines along with details on how to contact your internal support department. All you have to do is create the files which are very specific and place them in the location. Open a new notepad document and copy the text below in to it. [general] Manufacturer=Your First line here Model=Your second line here [Support Information] Line1=" Your first line here" Line2=" A second..." Line3=" and a third..."
Replace the text with your chosen information. 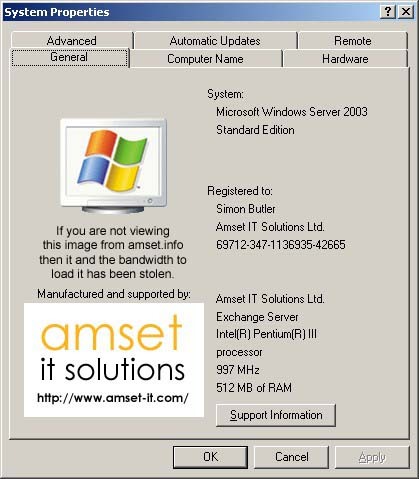 Line1=" Maintained by Amset IT Solutions Ltd."
When creating your own text, it is important that you follow the pattern shown. There must be no breaks between the lines and no spaces between the "=" and start of the text. You can increase the number of lines by simply adding more and increasing the number. Once you have finished creating the file, you need to save it. The file name you MUST use is "oeminfo.ini". In order to be able to save the file without the ".txt" extension, choose in the "Save as file type" selection, change it from ".txt" to "All Files". You can then enter your own extension. The logo also needs to be created in a specific way. The image can be no larger than 182 pixels x 114 pixels. It can be smaller, but anything larger will be cropped. The file also needs to be in ".bmp" format. You will probably want to create a special image for this application so that you can make the best use of the space. As it is a bitmap, you cannot make use of transparency options, so we suggest that you put your logo in a contrasting colour as in our example screenshot. This will ensure that no matter what colour scheme is in use, the image looks as you want. However with Windows XP (and Windows 2003 Server), if you use an image that is smaller than the optimum size, then Windows will just centre it in the available space. With any version of Windows older than XP (2000, ME, 98, 95) Windows will stretch it to fill the available space. This can look odd. Therefore you might want to consider having two images and deploy different ones depending on the OS. If this isn't possible, using a fixed sized image is best as it will allow you to control exactly how the image looks. Once you have created the image, you need to save it with a special file name: "oemlogo.bmp". No other name can be used. Once you have created the files, they need to be positioned correctly. Both files need to be located in the same place. As an alternative, you could use one of the batch files below. Once the files are in place, you will be able to see the changes immediately. Right click on "My Computer" and choose "Properties". If you make further changes to the files then these will also be seen immediately. If you are using the same files for all operating systems, then you can use this batch file. This file will work out the correct location for the files and copy them to the appropriate location. If you are deploying to Windows 2000 and Windows XP with different logos, then you might want to consider an automated batch file deployment. The script below detects what operating system the machine is running, then copies the required image across before renaming it so that Windows can pick it up. It is based on our "Detecting the Operating System" sample script which you can read about here (external site). echo off rem *************************************************** rem Script for deploying OEM INFO and OEM LOGO to rem different operating systems rem Simon Butler, Sembee Ltd. 12-12-03 rem see http://archive.sembee.info/netadmin/oeminfo.asp rem Requirements rem Image file for Windows 2000 named oemlogo-2k.bmp rem Image file for Windows XP named oemlogo-xp.bmp rem And oeminfo.ini file. rem rem All three files should be placed in the same rem directory as this batch file rem If running from login script, place all three files rem in your "netlogon" share on the domain controllers. rem Remember - if you are running from a network share rem it must be a mapped drive! rem *************************************************** rem Get the OS and dump to file ver >%systemdrive%\ver.txt Rem now find the operating system and act accordingly findstr "4.0" %systemdrive%\ver.txt if not errorlevel 1 goto nt4 findstr "5.0" %systemdrive%\ver.txt if not errorlevel 1 goto win2k findstr "5.1" %systemdrive%\ver.txt if not errorlevel 1 goto winxp findstr "5.2" %systemdrive%\ver.txt if not errorlevel 1 goto win2003 goto win9x :nt4 set OpSys-NT4 echo %OpSys% >>%systemdrive%\result.txt rem Windows NT4 settings copy oeminfo.ini "%systemroot%\system32" copy oemlogo-2k.bmp "%systemroot%\system32" del "%systemroot%\system32"\oemlogo.bmp rename "%systemroot%\system32\oemlogo-2k.bmp" oemlogo.bmp" goto next :win2k set OpSys=Win2K echo %OpSys% >>%systemdrive%\result.txt rem Windows 2000 settings copy oeminfo.ini "%systemroot%\system32" copy oemlogo-2k.bmp "%systemroot%\system32" del "%systemroot%\system32"\oemlogo.bmp rename "%systemroot%\system32\oemlogo-2k.bmp" oemlogo.bmp" goto next :winxp set OpSys=XP echo %OpSys% >>%systemdrive%\result.txt rem Windows XP settings copy oeminfo.ini "%systemroot%\system32" copy oemlogo-xp.bmp "%systemroot%\system32" del "%systemroot%\system32"\oemlogo.bmp rename "%systemroot%\system32\oemlogo-xp.bmp" oemlogo.bmp" goto next :win2003 set OpSys=Win2003 echo %OpSys% >>%systemdrive%\result.txt rem Windows 2003 settings copy oeminfo.ini "%systemroot%\system32" copy oemlogo-xp.bmp "%systemroot%\system32" del "%systemroot%\system32"\oemlogo.bmp rename "%systemroot%\system32\oemlogo-xp.bmp" oemlogo.bmp" goto next :win9x set OpSys=9x echo %OpSys% >>%systemdrive%\result.txt rem Windows 9x settings copy oeminfo.ini "%systemroot%\system32" copy oemlogo-2k.bmp "%systemroot%\system32" del "%systemroot%\system"\oemlogo.bmp rename "%systemroot%\system\oemlogo-2k.bmp" oemlogo.bmp" goto next :next echo done >>%systemdrive%\result.txt echo Cleaning up! del %systemdrive%\result.txt del %systemdrive%\ver.txt rem if problems, put REM in front of above two lines rem to read the results files. If you do not see anything, check the names of the files - as they must be as shown. Once you have checked the file names, ensure the files are formatted correctly. If you are using the script file, put "rem" in front of the two lines that start "del" at the end so that the results files are not deleted. More Content from Sembee Ltd.
Resources on exchange.sembee.info Other Sites Sembee Ltd.
© Sembee Ltd. 1998 - 2011. Reproduction of any content on this web site is prohibited without express written consent. Use of this web site is subject to our terms and conditions. All trademarks and registered trademarks are property of their respective owners. This site is not endorsed or recommended by any company or organisation mentioned on this site. Sembee is a registered trademark of Simon Butler and is used under licence.